A common new year’s resolution is to lose weight, though many people give up before the end of January. That doesn’t have to be you. We’re happy to introduce Real Appeal. Online tools to help track your food, activity and weight loss progress. A Success Kit with food and weight scales, recipes, workout DVDs and more – shipped to your door. *Real Appeal is available at no additional cost as part of the health benefits plan to employee members of United Healthcare (and their covered spouses and dependents 18 or over) with a BMI of 23 or higher. 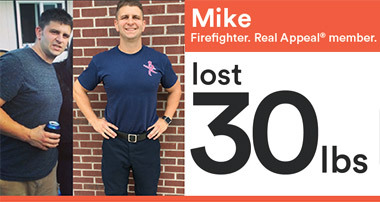 Real Appeal members who attended 4 or more sessions during the program lost 10 pounds on average. Talk to your doctor before starting any weight loss program.